According to rental site Zumper, median rents for a one bedroom in Noble Square are hovering around $1,450. So how does the low-end pricing on a Noble Square rental look these days--and what might you get for the price? We took a look at local listings for studios and one-bedroom apartments to find out what budget-minded apartment seekers can expect to find in the neighborhood, which, according to Walk Score ratings, is extremely walkable, is convenient for biking and has excellent transit. Listed at $1,195/month, this one-bedroom, one-bathroom apartment, located at 1452 N. Bosworth Ave., is 17.6 percent less than the $1,450/month median rent for a one bedroom in Noble Square. The building features on-site laundry and on-site management. In the unit, expect to find central heating, hardwood flooring, a ceiling fan, a dishwasher and wood cabinetry. Hairball alert: cats are welcome. This studio apartment, situated at 1418 W. Division St., is listed for $1,322/month for its 1,000 square feet of space. In the unit, look for both air conditioning and central heating, hardwood flooring, a ceiling fan, a balcony, high ceilings, a walk-in closet, a skylight and garden access. The building features assigned parking, outdoor space and extra storage space. Pets are not permitted. Then there's this 1,000-square-foot apartment with one bedroom and one bathroom at 1458 N. Bosworth Ave. that's listed at $1,400/month. In the unit, expect both air conditioning and central heating, hardwood flooring, a ceiling fan, high ceilings, a dishwasher, a walk-in closet and wooden cabinetry. Amenities offered in the building include on-site laundry, secured entry and extra storage space. Feline companions are permitted. Listed at $1,425/month, this 750-square-foot one-bedroom, one-bathroom apartment is located at 1326 N. Cleaver St., #1R. The building offers on-site laundry. In the unit, expect to find both air conditioning and central heating, hardwood flooring, a dishwasher, stainless steel appliances, granite countertops and wooden cabinetry. Both cats and dogs are welcome. 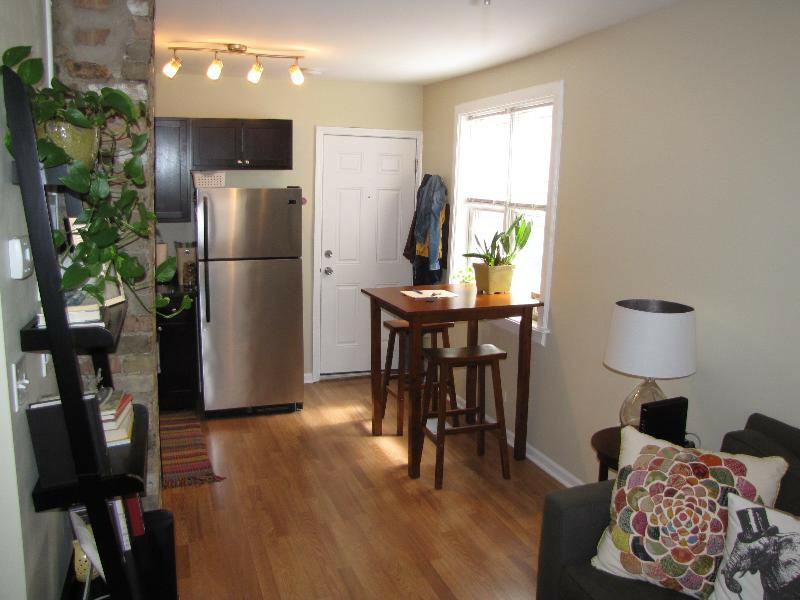 Lastly, this studio apartment, situated at 1461 W. Fry St., #3R, is listed for $1,700/month. In the unit, you'll find both air conditioning and central heating, hardwood flooring, a dishwasher, maple wood cabinetry, granite countertops, a breakfast bar and stainless steel appliances. When it comes to building amenities, expect garage parking and outdoor space with a patio. Pets are not welcome.